I am thrilled to publish our third installment of ‘Tulip Tales’! This time, my dear friend, Kim will share her story. Only hours earlier, I’d had an emergency c-section due to inactivity from the baby. My life was changing at that very moment, I just didn’t realize how much. After hearing those words from the doctor, I’ll be honest, I felt like I shouldn’t get attached. I was scared. I had almost given up. I felt like I was mentally checking myself out of this world. For the first time in my life, I had an overwhelming feeling of helplessness, and looking back on it now, I can see that I simply did not know how to cope. 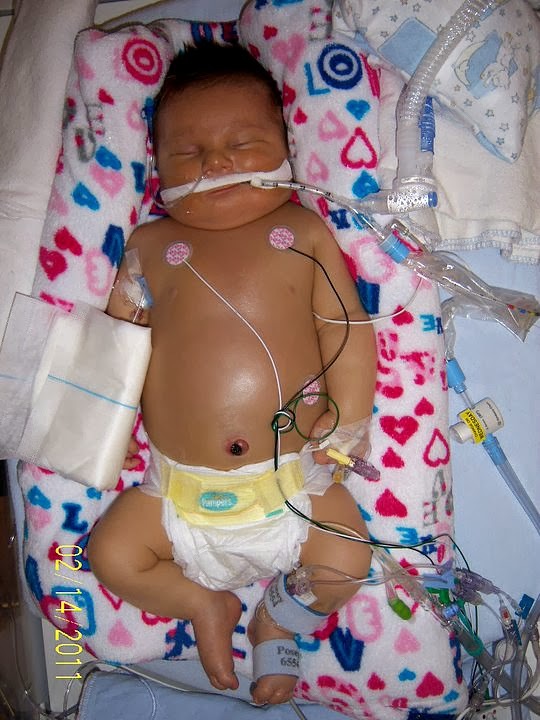 My little “trooper” was born with blue feet, and severe complications that included underdeveloped lungs, an enlarged liver and heart, hypertension and hyperglycemia. In addition, initial EEG reports showed long pauses in brain wave activity and we were referred for a hearing test for unresponsiveness. Things did not look good. Even though the odds were against him, Carter was discharged after 4 weeks in the NICU. I was elated and felt that finally we would be able to start living as a family. Carter was born in St. John’s but at the time, my family was living in Houston, Texas. As soon as Carter was cleared to fly, we were excited to return back to Houston. That excitement slowly dissipated as each day was filled with the sounds of a screeching baby. After what we experienced, however, I was very grateful to hear him cry and I embraced all that he offered, at least for the first couple of months. At some point, hearing him cry ALL DAY.. NO NAPS.. NOT FEEDING…kind of wore me down. I brought him to a pediatrician, who suggested he was colicky. I was glad to get a diagnosis and to know that there was a light at the end of the tunnel.. but that was not the case. The prescription didn’t work and the crying didn’t stop. A trip back to Newfoundland was coming soon for a follow-up with Carter’s specialists at the Janeway, including the infant screening test for hearing. I was thrilled to be going home! At the hospital a few days later, my excitement was abruptly cut short as I received a new diagnosis: “Your baby is profoundly deaf”. What?! I was in shock. In fact, I felt completely helpless yet again. When I went home that day, I landed in bed and physically did not move. I don’t remember how long I was there, but I do recall my father visiting me and he told me that I had a choice. I could stay in bed and be miserable, or I could get up, take care of my children and enjoy and treasure every moment. Wise words from my father! As difficult as it was for me at that time, I knew he was right, so as soon as we returned back to Houston I started learning everything I could about the deaf community. I ordered every Baby Sign Language DVD on the market! I was committed, and knew that as a family we had to be actively involved and to embrace this new culture. I found myself becoming more excited as I watched the DVD’s, learning the new language and teaching my older son Hunter (who was 2 at the time). We also made the huge decision to have Carter implanted with Cochlear Implants to allow him the best possible opportunity to hear. As months went by, Carter was exhibiting some rather concerning traits and not meeting any milestones. On our next visit back to NL, we saw a neurologist who confirmed that Carter was indeed significantly developmentally behind. He told us that at Carter’s age, a diagnosis could not be given, however we were to seek physiotherapy and occupational therapy as soon as we returned to Houston. 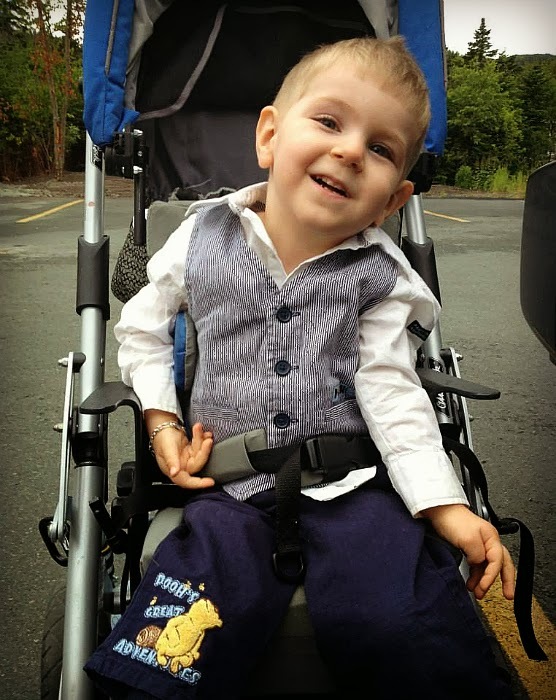 I had felt for several months that something wasn’t right, and even though a diagnosis could not be given, I had a sinking feeling that Carter had CP. When Carter was 10 months old, we drove back to NL from Houston with our two sons, and this time we would be staying. 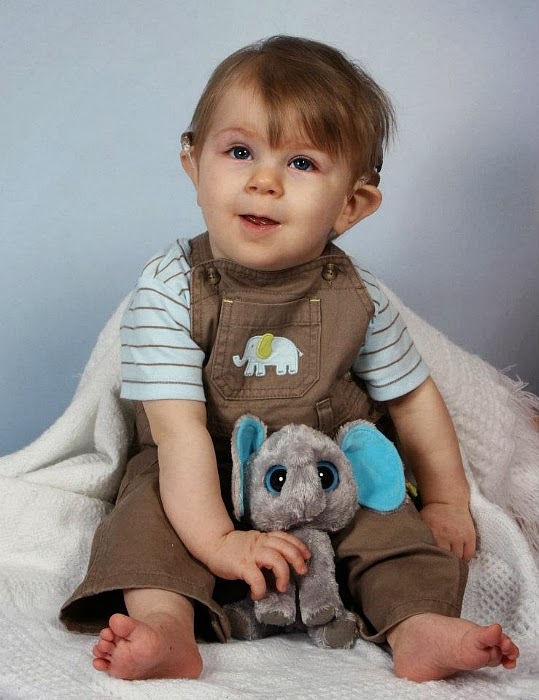 Carter was scheduled to have his cochlear implant surgery and we realized that he would receive the best care at the Janeway, and it just made sense to be home closer to family and friends for support. 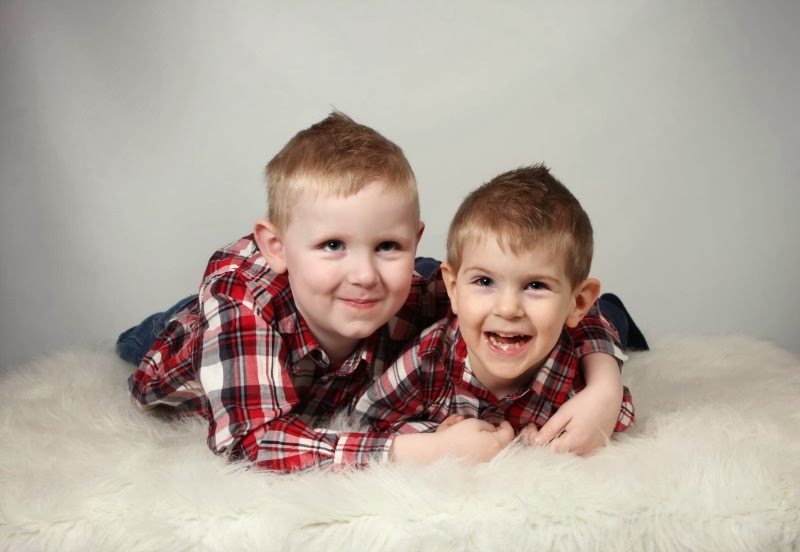 A month later, we received the official diagnosis: “It’s likely your son has cerebral palsy”. They say “likely” because after testing him for everything else this was the only possible explanation, and there isn’t a specific test for CP. Even though I had suspected it, I was absolutely crushed with the diagnosis. I couldn’t help but feel guilty and mad all at the same time! I felt sorry for Carter and thought, how unfair.. he’s already deaf! I didn’t know how I was going to cope. I couldn’t fix it! For a very long time I felt there was nothing I could do. I’m not a doctor or a therapist. I thought, the only thing I can do is be there for him. Take him to his appointments, work on things at home with him. But it just wasn’t enough for me. Feeling the need to do more, an idea was born when the Hard of Hearing Association contacted me to help out with a walk-a-thon. I offered to bake cupcakes and arrange them in a decorative pot to look like bouquets of flowers and sell each one for $20. The idea was a hit and in just a few days, I baked and decorated more than 500 cupcakes, raising over $1000.00. ‘Carter’s Cupcakes‘ was born! I learned a lot in that short week. Baking and decorating those cupcakes made me come alive! I found it meaningful. I felt that I was finally doing something more for Carter. Through Carter’s Cupcakes, I could help raise awareness and make donations to the charities my son was involved with. In addition, I discovered that I loved doing it and found it to be very therapeutic and a much-needed distraction from a very stressful period. My husband, Todd was also feeling the same desire to do more, so after volunteering hundreds of hours and donating more than $10,000.00 of our own money, he built a backyard ice rink, hoping it would attract attention to raise money and awareness for the charities as well. In addition to the overwhelming amount of provincial, national and international publicity, to date “Reason for the Rink” has raised more than $72,000.00 for Easter Seals NL, Rainbow Riders NL and Mazol Shriners. Throughout the entire process of late nights, early mornings and freezing temperatures, my husband would continuously comment on how therapeutic he felt it was for him. At a time in our lives where things seemed to be out of control or uncertain, his rink – like my cake adventure, became something meaningful, something concrete. We could say we played a direct role in making a difference. It gave us something to look forward to, something to be excited about. We were being proactive, and it gave us hope. Carter will soon turn 3 years old and is one of the brightest kids you will ever meet! His smile is contagious and can literally light up a room and lift anyone’s spirits. He is rarely in a bad mood and is a social butterfly! He has recently started communicating by using a few signs and has been hearing at an average level when wearing his cochlear implants. His favourite activities are playing with his brother and snuggling with Daddy. He is extremely inquisitive, attentive and never wants to miss out on anything! He absolutely loves Toopy & Binoo and will never turn down chocolate pudding! Other than the fact that he has a team of a dozen specialists continuously working with him, he is your average 3-year-old! Although the past few years have not been what I anticipated, I feel very lucky! Doctors have told us that Carter will most likely never walk or talk, so people may think we are crazy to consider ourselves “lucky”, but we are. We are lucky because it opened our eyes, our minds and our hearts in ways we could never have imagined. 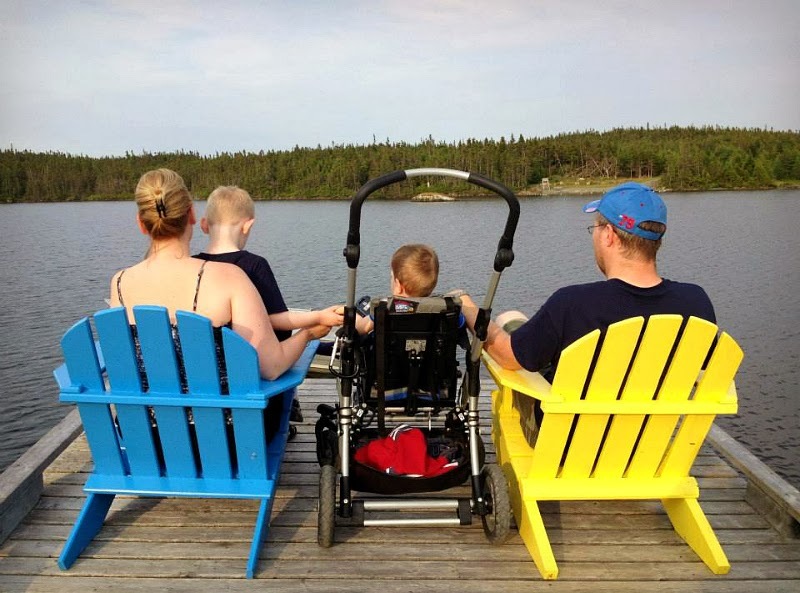 Only 3% of Canadians fall into the category of being a “Special Needs Family”. 97% of families will never get to experience what we have, which has made us not only a stronger family but better human beings, and for that we are eternally grateful. We are actively involved in our community in ways we had never dreamed of. We are passionate not only about what we do but more importantly why we do it. We learned how easily we took so many things for granted with our first child and we can now treasure so much more with him as well. We are so lucky! We don’t focus on the can’t but the can and with that thought process we can do anything.. and we will! We can’t predict what the future holds, and we undoubtedly worry and stress much more than the average family but at the same time, life has more meaning for us now because of Carter. In his short life, he has already taught me much more than I could ever teach him! To say that I can relate to Kim is an understatement. Our stories are very similar, and her words really struck a chord with me. Thank you Kim, for opening your heart and sharing your beautiful family with us! We appreciate ALL that you do!